Newton's first law states that "The velocity of a body remains constant unless the body is acted upon by an external force." Would losing a wheel count as an external force? That's exactly what happened on a drive in my MGB V8, The Silver Lady, through the North Georgia mountains. Seeing the wheel overtake me as I negotiated a curve produced a terribly unsettling feeling. We managed to come to a stop safely. Upon inspection, we found that the wheel arch had been re-designed when the wheel said good-bye to the car. This was the excuse I needed to add fender flares. 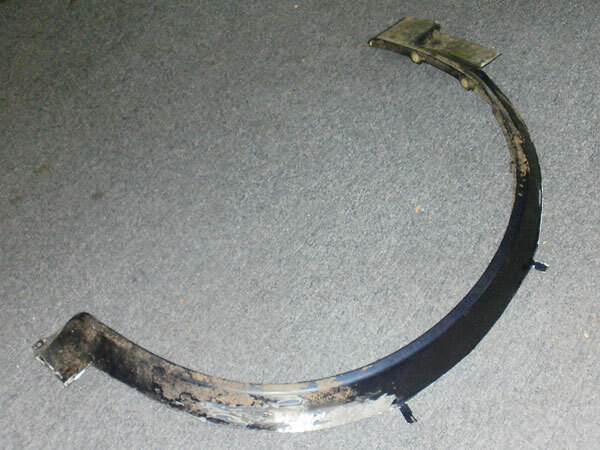 There are a number of well-known fender flare alternatives for MGBs. I was only interested in grafted-on flares; not replacement fenders. When it comes to grafting flares onto existing steel fenders, the first decision is "fiberglass or steel?" 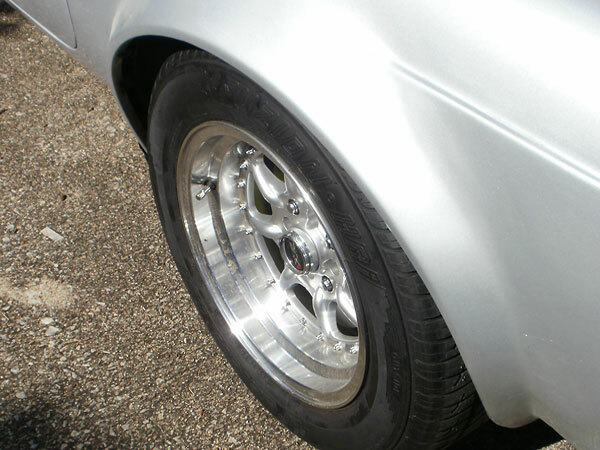 The most popular and easily sourced fiberglass option are "Huffaker" flares. 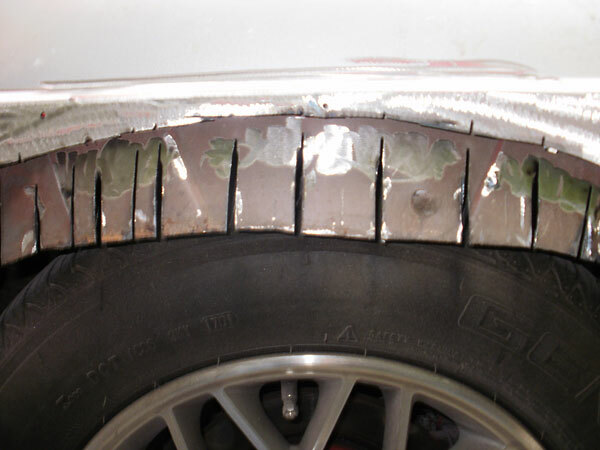 That's the style of flare used on Huffaker Engineering's famous SCCA championship winning racecars during the 1970s. 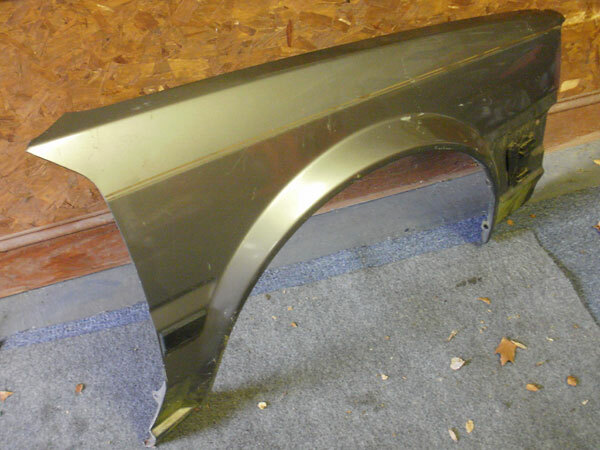 However, I wanted steel fender flares so I decided to visit a local junkyard and see what was available. When it comes to steel flares for an MGB, the most familiar donor car options are the Dodge Omni / Plymouth Horizon models or alternatively the Volkswagen Rabbit. Unfortunately, I couldn't find any of these cars at my local junkyard. Armed with the MGB's dimensions, tape measure, notebook, and a camera I went off to look for other alternatives. Off came both fenders, leaving a sad looking 1995 Nissan Stanza. Enter the Nissan Stanza. 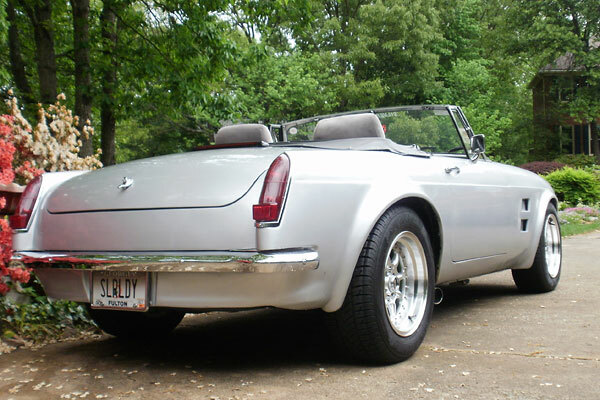 As I took measurements and wrote them in my notepad, I realized the Stanza front wheel arch has similar dimensions to an MGB. I immediately noticed a advantage of Nissan Stanza flares: compared to Rabbit or especially Omni flares, the Nissan flares seemed to wrap further around the circumference of the wheel arch. I liked the look, so I began unbolting a pair of Stanza front fenders. In my enthusiasm, I almost forgot about rear arches. I hadn't brought cutting equipment with me to remove the Stanza's rear fenders, so I'd have to adjust my plans. 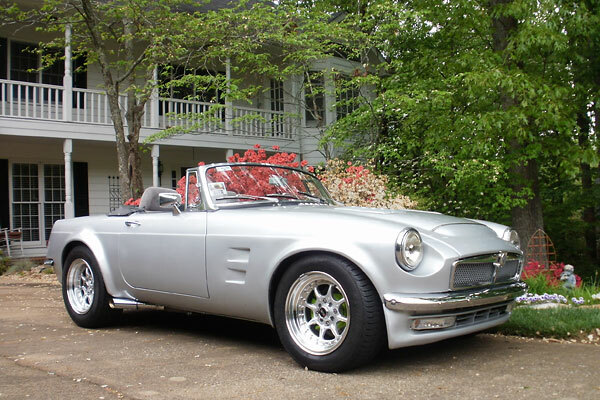 I looked at the Nissan front flare profile and realized they could be used on the rear of The Silver Lady if I used the Stanza's left front fender on the MGB's right rear, and the Stanza's right front fender on the MGB's left rear. So off I went around the junkyard looking for another set, and with a feeling of success I imagine similar to that of Stanley when he eventually found Livingston, I discovered another Nissan Stanza and relieved it of its two front fenders. When I returned home with my plunder, my wife Sue just looked at the pile of metal on the driveway, rolled her eyes, and went back inside the house. I attacked the Stanza fenders with my trusty angle grinder. The next part of the process really confused Sue; I attacked the fenders with my trusty angle grinder. I held the first trimmed fender flare up against the Silver Lady from time to time. A little more trimming here and there, and before long I had flares that seemed to fit very nicely. Nissan Stanza fender flare newly welded onto an MGB front fender. When the Stanza flares fitted to my satisfaction, the next step was to prepare the MGB for welding. I started at the front fenders, trimming the wheel lips and I grinding paint back from the weld zone. With Stanza flare carefully clamped into position, I stitch-welded with a MIG. 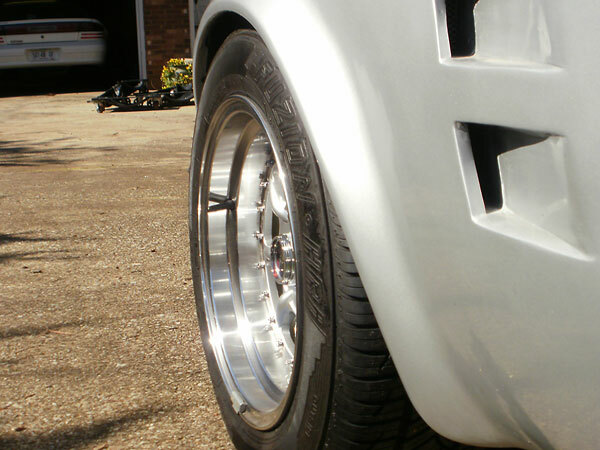 After going back and filling in gaps, the front wheel flares looked like the picture above. Next came a layer of fiberglass, placed into the valley created between flare and fender. This adds additional strength and reduces the amount of polyester filler needed. Nissan Stanza flares blend nicely inward toward the front valance. 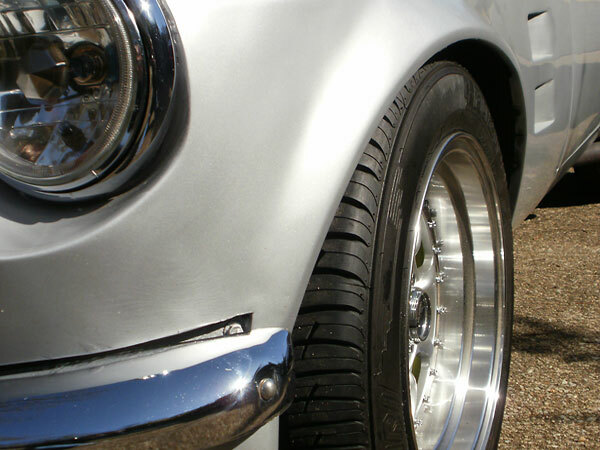 The front flares don't cross the waist line where stainless steel trim was originally applied. Now I was ready to work on the rear fenders. I had previously decided to install 225/60R15 tires on a new MGC axle. 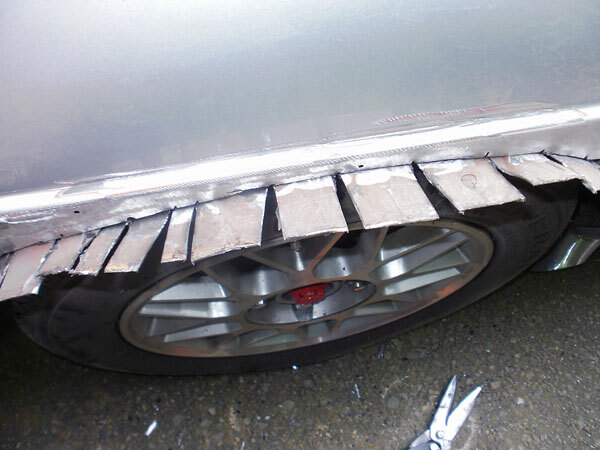 With the wheels and tires I selected, it was evident that my tires would protrude beyond The Silver Lady's fender, so even more cutting and welding was needed. Installing rear flares is complicated by the need to seal between inner and outer fenders. After trimming the outer fender skin away, I sliced the inner fender opening to make "fingers." Then I folded the fingers outward and welded them to the outer skin to close up the gap. With the old wheel and tire in place, I drew an arc on the fender the length from the center of the new wheel to the outside of the tread plus 1.5" to be on the safe side. I then placed approximately 180 pounds of ballast in the trunk. With the car loaded down, I confirmed that clearance would be okay. I also took this opportunity to check for clearance between bump rubber and bump stop. The next step was to cut to my marked line, through just the outer fender. The inner fender was "fingered" as shown in the photos above. In other words, I sliced the inner fender so I could fold it outward and upward to seal to the outer fender. (The fingers were longer than necessary, so after folding them to shape I cut away the excess material.) With inner fender fingers welded to the outer fender, I was almost ready to move on but first I decided to reinforce and seal up the area with a layer of fiberglass. From that point, flaring the rear fenders was fairly similar to what I'd already done at the front. The main difference was that the flares needed to be spaced outward a bit at the top. I had previously decided that as long as I was flaring the fenders, I should make the flares wide enough for the tires I really wanted. I had chosen a 225-width tire, so I worked with it. 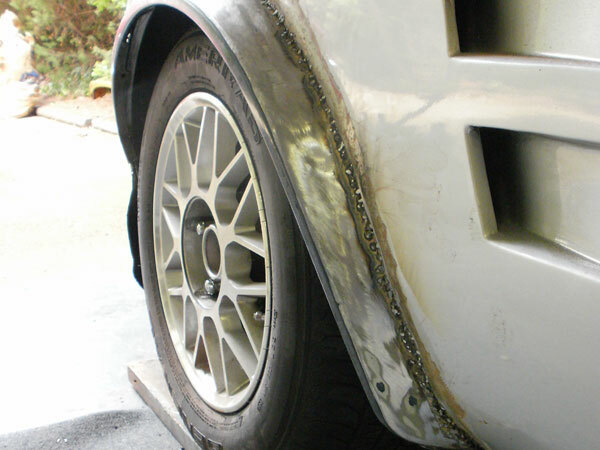 I spliced-in spacer sections between the Nissan flares and the MGB quarter panels along the top of the arch. Unlike the front, the rear fender flares do cross the horizontal feature line. After stitch welding I again laid fiberglass in the valley created between fender and flare, finishing with a skim of polyester filler. Integration of Nissan Stanza fender flares into the overall Silver Lady concept. XXR "002" 15x7 Hyper Silver aluminum wheels, +38mm, 5.5" back spacing. 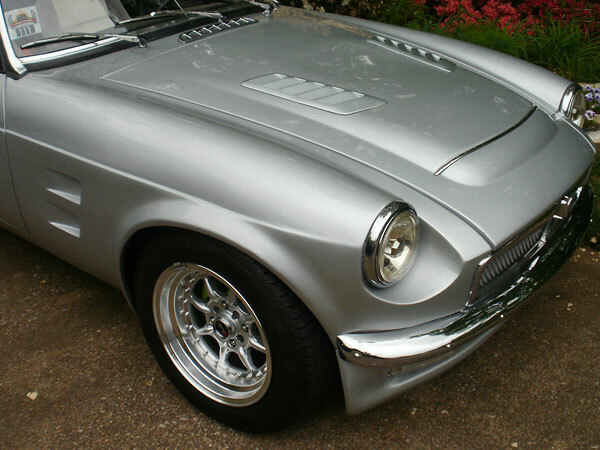 Nissan Stanza donor parts give this MGB a distinctive wrap-around fender flare appearance. Looks are one thing, but how about performance? With a four-liter V8 under the hood this car was already pretty quick. Now, with the extra tire contact area (from 205-width front and 225-width rear tires) and with wider rear track, The Silver Lady is even more of a dream to drive. Disclaimer: This article on this page was researched and written by Mike Cook. Views expressed are those of the author, and are provided without warrantee or guarantee. Apply at your own risk. Photos by Mike Cook for BritishV8 Magazine. All rights reserved.